It has become an annual tradition. 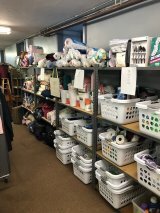 Neighbors near and far donate their experienced holiday items, along with some new items. 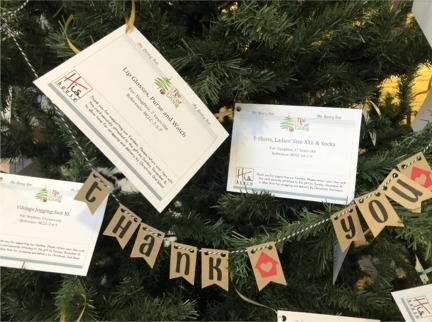 The 2018 boutique was blessed by so many responses to appeals placed in churches and Next Door. 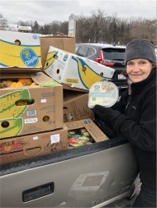 The bin at Mount Calvary Lutheran Church was overflowing and required pickups every day. 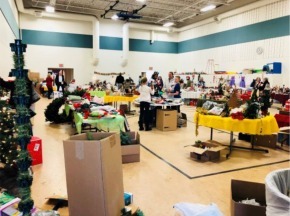 Volunteers sortes and organized the items...hundreds of items...more than enough to fill the gym at Mount Calvary Lutheran Church. 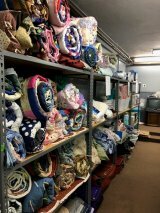 Items were priced to go....no one wanted anything left over storage is a precious commodity, reserved for household items for families setting up a new home after experiencing homelessness. Martha Brannon, Executive Director of HHF, was thrilled with the partnership offer from MyPillow. Kim Raiolo, from MyPillow's foundation, not only delivered MyPillows at the Boutique, she kindly worked the entire weekend. Her enthusiasm and generosity were so appreciated. Kim and MyPillow were definitely stars of the show! Due to everyone's hard word and support, many boutique items found new homes and much-needed funding for the HHF programs was achieved. THANK YOU to our volunteers, donors, SHOPPERS, MyPillow, and Mount Calvary Lutheran Church for hosting our event. We look forward to seeing you at the 2019 Boutique! His House and MyPillow are teaming together to deal with homelessness. 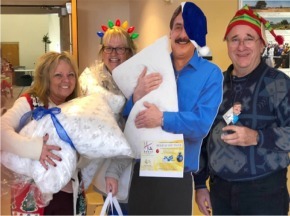 Michael J. Lindell, of MyPillow, has graciously donated pillows to His House Foundation. 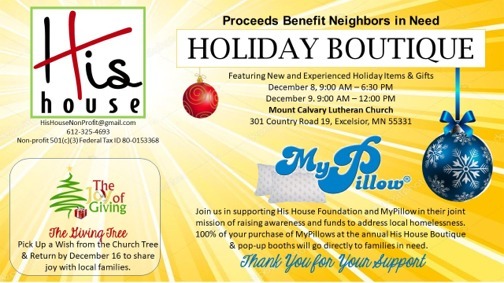 HHF will sell the pillows at their annual Holiday Boutique and future pop-up events. Buyers may purchase the pillows for themselves, their family and friends OR sponsor a pillow for someone in need. This spectacular gesture will be the premiere fund raiser with 100% of the proceeds going to His House Foundation to benefit needy families. Kim Raiolo from the MyPillow Foundation, presented the pillows at the 2018 Holiday Boutique. A HUGE thank you to Michael and Kim for this amazing gift. If you are interested in purchasing a pillow, please contact us.